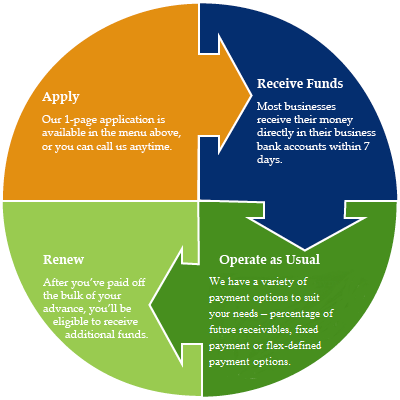 A business cash advance is an innovative form of funding that allows you to receive the working capital you need fast and pay it back flexibly. It’s not a loan: you are literally selling us a portion of your future credit card sales or total deposits. Principis simply collects a percentage of the credit card batches or total deposits until it has collected the full amount of receivables purchased. This usually takes 6 to 15 months. Upon receipt, a qualified Principis Capital representative will contact you within 1 business day to discuss your funding options. Your submitted information is then run through our proprietary credit model in order to determine if you are pre-qualified for a business cash advance. Your official pre-qualification status will be communicated to you within 2 business days. If you are pre-qualified, you will be sent a contract containing the terms of the business cash advance and continue on to Stage 3. ** Even if your credit is poor, you can easily qualify as long as your business is solid! When we receive your signed contract and a copy of a government-issued ID (driver’s license or passport), our Underwriters will confirm the accuracy of the submitted information and follow up with you if anything further is needed. This Verification & Final Approval process is done within 1 to 3 business days. After it is completed, the funds are wired into your company’s bank account! Whether you need urgent cash to cover a temporary deficit, or you want to take your business to the next level, a working capital cash advance can help secure the future of your company. Apply now to get an answer from us within 1 business day. There are no fees of any kind, and the application will take you less than 5 minutes. We fund businesses of all sizes, ranging from the smallest corner pizza shop to multi-location retail and service chains. Our minimum funding size per location is $4,000 and our maximum is $150,000. How Can You Best Prepare Yourself to Get a Cash Advance? Gather your recent credit card processing statements and bank statements, and make sure they’re complete. If your business is seasonal, be ready to show what your volume looks like during both the high and low seasons. Make sure that you have documents that show your ownership of the business, in case there are no public documents that we can access. If you have moved recently, be sure that you can show that there was no negative impact on the business. Think carefully about how you plan to use the funds, and how much you really need.